Joseph Anderson and the ATK collaborators have formally launched the ATK. The Ambisonic Tool Kit brings together a number of classic novel tools for the artist working with Ambisonic surround sound. The ATK toolset has been gathered, authored and developed by Joseph Anderson over a number of years, and is now a collaborative open source (GLP) project. Supported by 53 pages of help files, the ATK enables the user to ‘think Ambisonic.’ Empowering the artist to address the impression and imaging of a soundfield – taking advantage of the native soundfield kernel paradigm the Ambisonic technique presents. FMR Records have announced their release of Dutch flautist Jos Zwaanenburg‘s latest CD. 20 Odd Years documents 20 years of Zwaanenburg’s collaboration with British composers who share his interest in electronically processed flute sounds. Recorded and produced by Joseph Anderson, it represents the first studio-based ‘virtual acoustic’ application of the ATK production system through use of the Ambisonic Toolkit (ATK). Work developed with composers Jonty Harrison, Alistair MacDonald, Stephen Montague, Roger Marsh, Tim Howle, Mike Vaughan, Paul Dibley and Michael Young appear on 20 Odd Years. Joseph Anderson will be giving a presentation, co-authored with Josh Parmenter, on the soon to be released ‘Ambisonic Toolkit for SuperCollider‘ at this year’s SuperCollider conference in London. 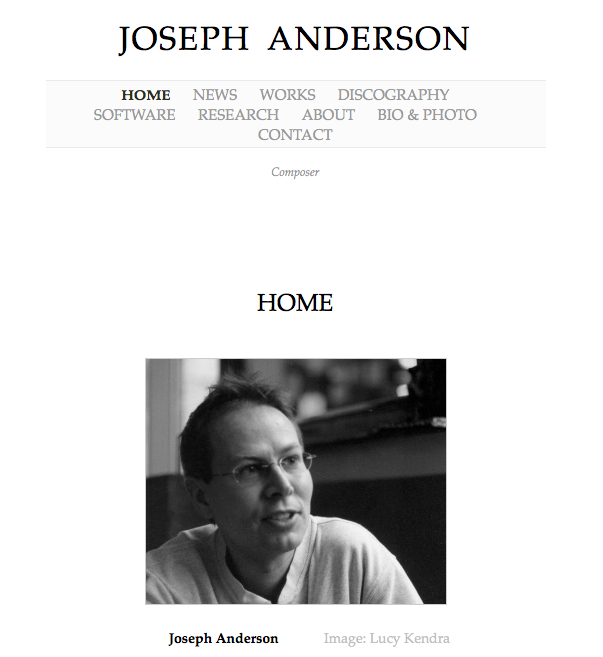 Joseph Anderson will be resident as an artist/researcher at DXARTS, University of Washington for two months, from late January 2012. Among his task there Anderson will be teaching postgraduates and furthering his research in ambisonic surround sound. Joseph Anderson will be performing Changes Music at the San Francisco Tape Music Festival, within the Sat 8pm concert. The festival this year celebrates 100 years of John Cage, with classic tape assemblages spanning his career, along with two new realizations of tape scores by the SF Tape Music Collective. We thought it would be useful for some to be able to access information about Joseph Anderson and his work so are building this website. We look forward to keeping you up to date with news of his work, performances and other events.